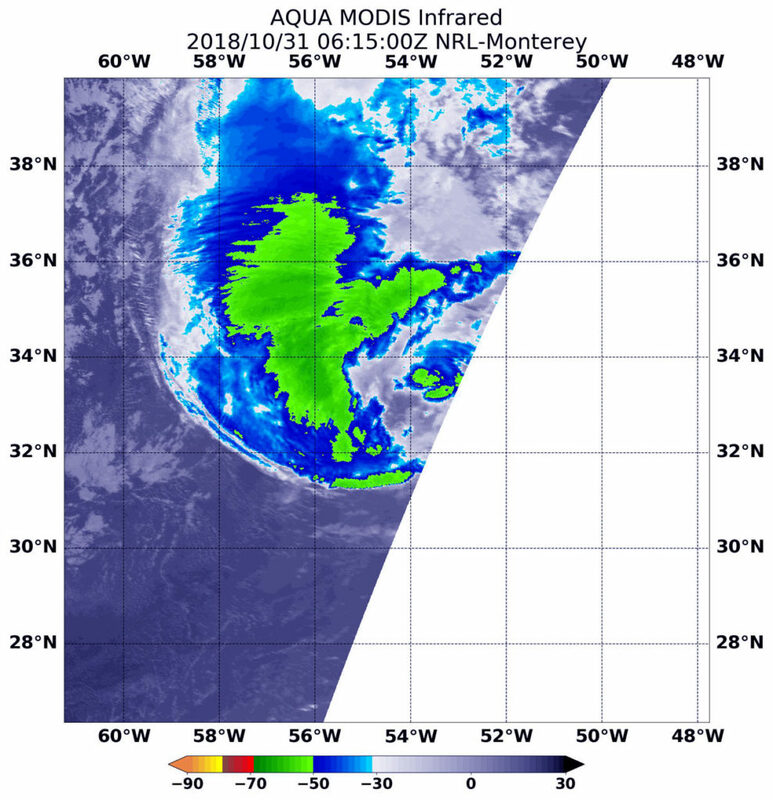 Hurricane Oscar has transitioned into an extra-tropical low pressure area in the northeastern Atlantic Ocean. The Global Precipitation Measurement mission or GPM core satellite provided a look at rainfall occurring within the storm. When a storm becomes extra-tropical, it means that a tropical cyclone has lost its “tropical” characteristics. The National Hurricane Center defines “extra-tropical” as a transition that implies both poleward displacement (meaning it moves toward the north or south pole) of the cyclone and the conversion of the cyclone’s primary energy source from the release of latent heat of condensation to baroclinic (the temperature contrast between warm and cold air masses) processes. It is important to note that cyclones can become extratropical and still retain winds of hurricane or tropical storm force. 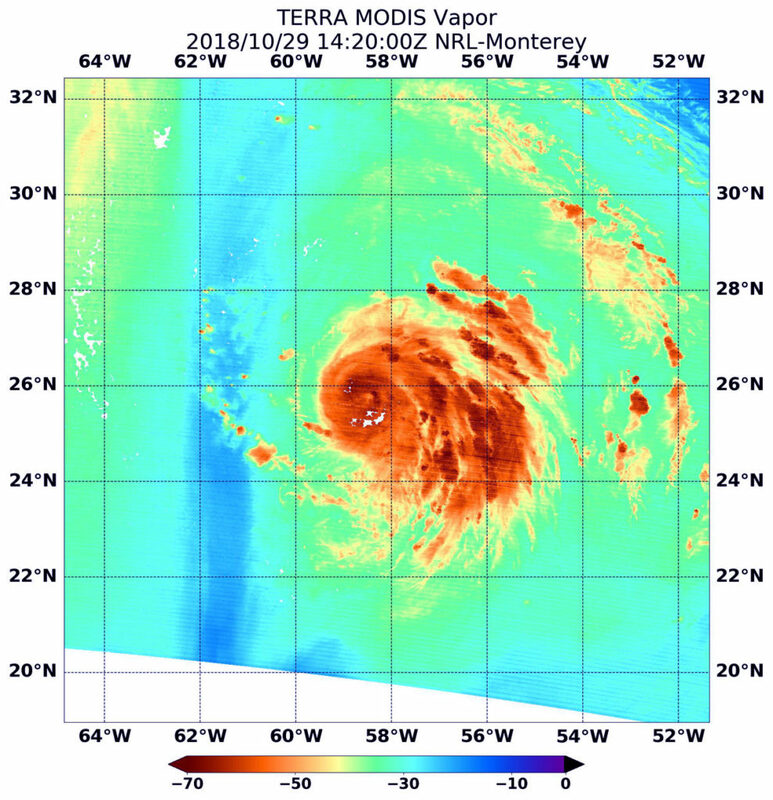 On October 31, 2018 at 8:43 a.m. EDT (1243 UTC) the GPM core observatory satellite had a pass over hurricane Oscar. 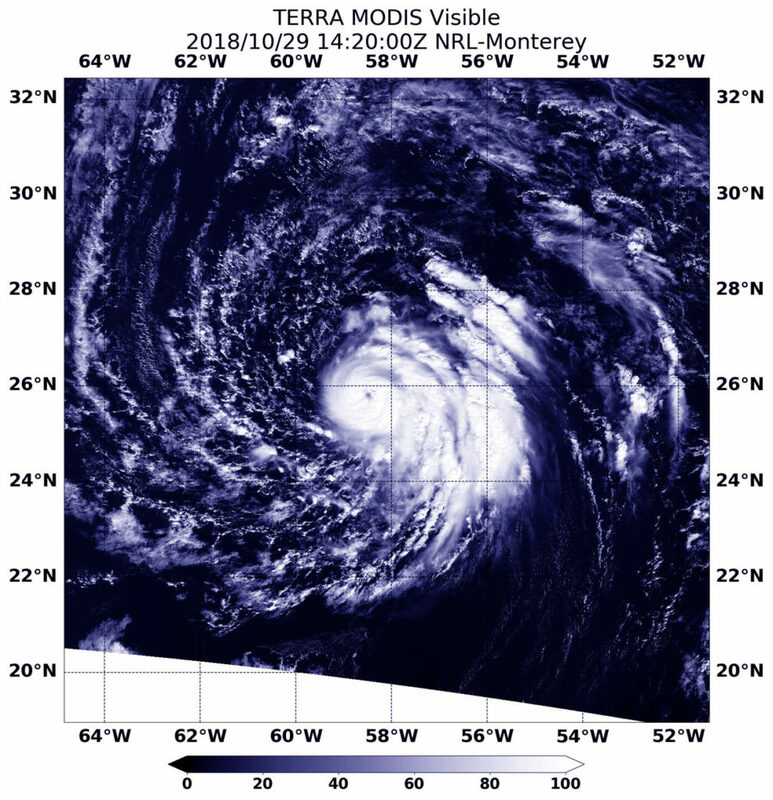 The hurricane had maximum sustained winds of about 74.8 mph (65 knots) and was moving toward the northeast while becoming more extratropical in appearance. GPM’s Microwave Imager (GMI) showed that the heaviest convective rainfall was located well northwest of the low level center of circulation. Rain was falling at a rate of about 2 inches (50.8 mm) per hour in that area. At NASA’s Goddard Space Flight Center in Greenbelt, Md. a simulated 3-D view was created from GPM data looking from the east toward the storm. The image was derived from GPM’s radar (DPR Ku Band) data. GPM’s radar swath (DPR Ku Band) passed through storms on Oscar’s western side. GPM’s DPR found that very few storm tops were reaching heights above 5.6 miles (9.0 km) but heavy downpours were returning strong radar reflectivity values to the GPM satellite. 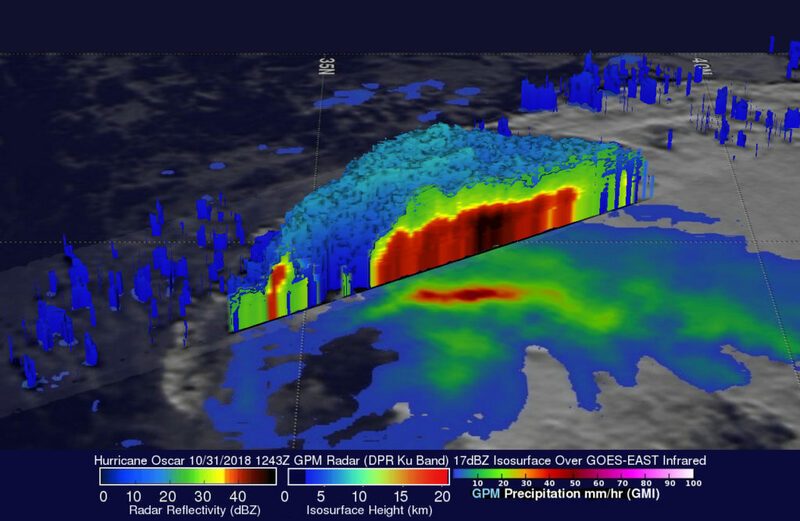 Radar reflectivity values were frequently observed in the 3D cross-section through heavy rainfall in the northwestern side of the hurricane. 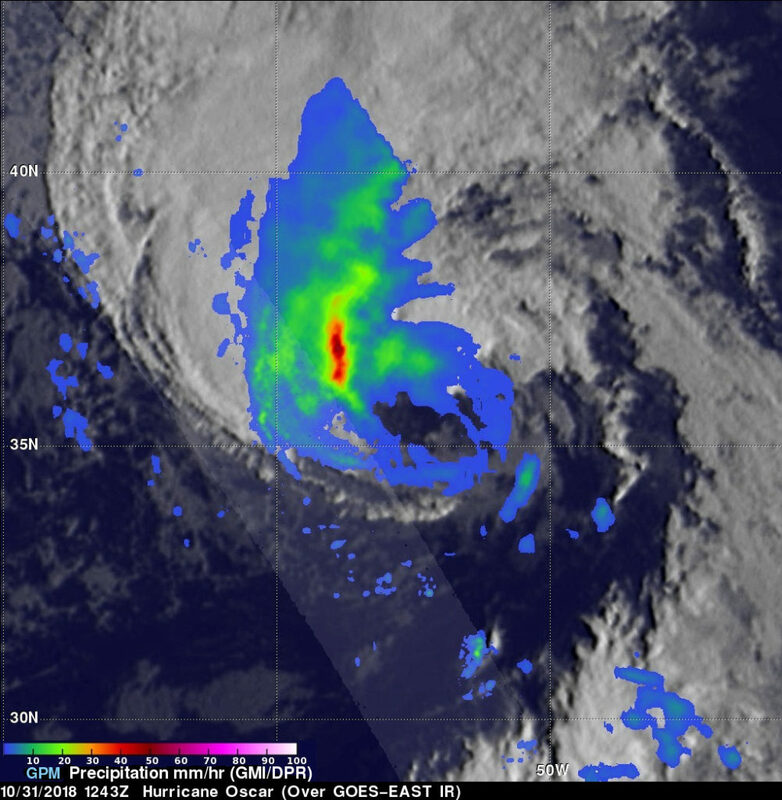 GPM is a joint mission between NASA and the Japan Aerospace Exploration Agency, JAXA. 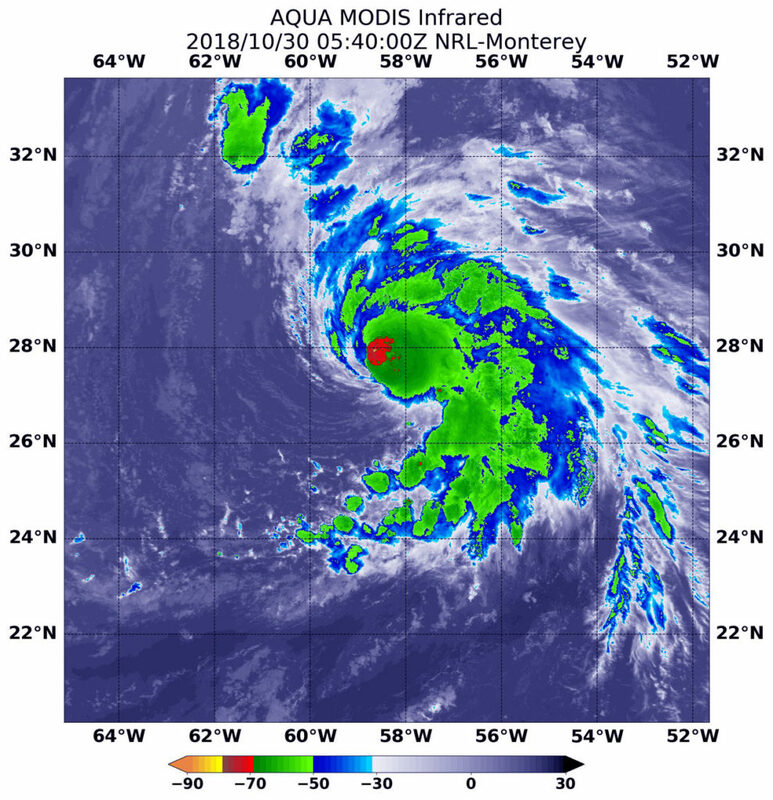 Oscar is now an extra-tropical low pressure area and is expected to pass northwest of Ireland over the weekend of Nov. 3 and 4 and will bring winds and rain to the country.